Description: Celebrate New Year’s Eve with the Telstars Rock n Roll Showband at the Wasaga Beach RecPlex with special guest award winning tribute artist, Brent Freeman as Jerry Lee Lewis, Buddy Holly and Elvis. Cocktails at 6:00 p.m. with dinner/show served at 7:30 p.m. catered by Georgian Circle Family Restaurant in Wasaga Beach. Joining Dianna for this week's BEACH CORNER are Debbie and Rene from the Telstars Rock n Roll Showband who will share the upcoming event along with a quiz being offered by the Telstars. Tickets are available at Georgian Circle Family Restaurant in Wasaga Beach or by calling Debbie at 416-627-1500. For more information on the Telstars RocknRoll Showband visit their Facebook and website at www.telstarsrocknrollband.com. 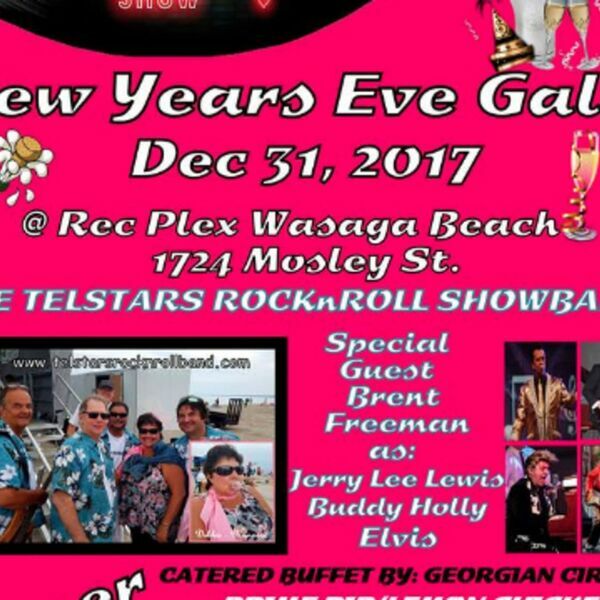 Celebrate New Year’s Eve with the Telstars Rock n Roll Showband at the Wasaga Beach RecPlex with special guest award winning tribute artist, Brent Freeman as Jerry Lee Lewis, Buddy Holly and Elvis. Cocktails at 6:00 p.m. with dinner/show served at 7:30 p.m. catered by Georgian Circle Family Restaurant in Wasaga Beach. Joining Dianna for this week's BEACH CORNER are Debbie and Rene from the Telstars Rock n Roll Showband who will share the upcoming event along with a quiz being offered by the Telstars. Tickets are available at Georgian Circle Family Restaurant in Wasaga Beach or by calling Debbie at 416-627-1500. For more information on the Telstars RocknRoll Showband visit their Facebook and website at www.telstarsrocknrollband.com.